"I now once More, hoisted English Colours & in the Name of His Maj.y King George the Third took possession of the whole Eastern coast from the above Lat.de down to this place by the Name of New Wales together with all the Bays Harbours Rivers & Islands situate upon the same Coast"
Born in Yorkshire, England, James Cook (1728–1779) had been a seaman since the age of seventeen, when he joined the merchant navy in the coastal town of Whitby. He spent his apprenticeship and early career working on trading ships along the English coast and in the Baltic and, after ten years in the merchant navy, Cook entered the Royal Navy. The young man displayed an aptitude for surveying, mapping and navigation, honing these skills in military conflicts against France. His talents were noticed by the Royal Society, who had bigger plans for him. Both the Royal Society and the British Admiralty were keen to send their ships to the Pacific for research and exploration purposes, and Cook, then forty, was the right man at the right time. 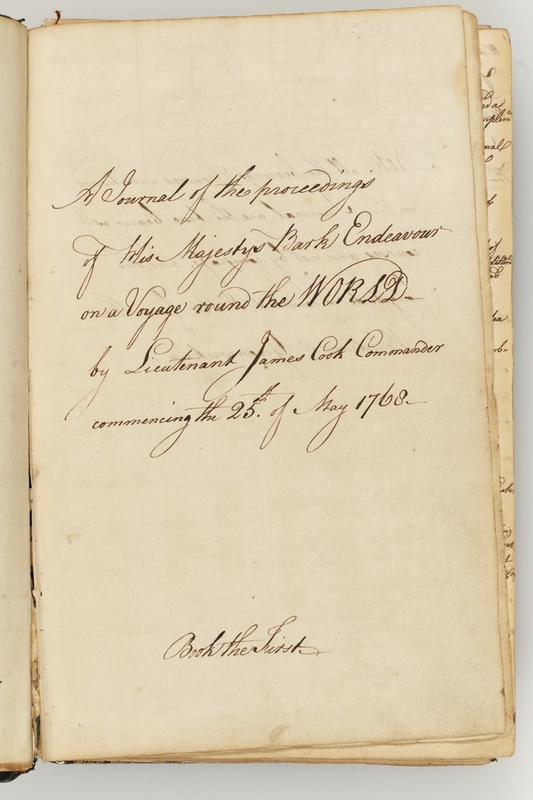 The State Library holds the copy of Cook’s log that he sent to the Admiralty from Batavia (now Jakarta, Indonesia). The copy was made by Cook’s clerk, Richard Orton, and differs from the holograph log (Cook’s original, now held at the National Library of Australia) because Cook substantially revised his own copy to include thoughts and impressions that came to him later, and to add detail to earlier sketchy accounts. Some scholars think that Orton’s copy represents a truer version of Cook’s original log, as it is sticks closely to the captain’s first recorded impressions. Cook himself borrowed quite a bit from entries in Joseph Banks' Endeavour journal, particularly in describing natural history and anthropology. Although the log is almost entirely copied out by Orton, there are many instances where Cook himself has inserted words or phrases that Orton missed. Orton made another, more careful, copy after the Endeavour left Batavia, which was presented to the Admiralty when the expedition returned to the UK and is now in the UK Public Record Office. This third known copy is held by the National Maritime Museum in Greenwich. The selections below include Cook's description and naming of Botany Bay (originally named Sting Ray Harbour) and the raising of the British flag at Possession Island in the Torres Strait, Far North Queensland. Here Cook formally took possession of the entire east coast of Australia for King George III and called it New South Wales.